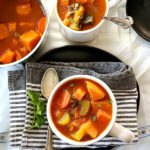 Sweet potato stew so rich and comforting to energize your body on those cooler winter days! It is gluten-free, vegan and made without grains. I always get so gleeful when I am about to share a recipe with you so I am thrilled to share this comforting rich sweet potato stew today! Probably because I love anything made with sweet potatoes like these vegan sweet potato biscuits that go perfect with this stew! 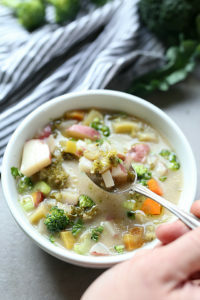 This stew is super chunky with only a few simple ingredients and a sweetness that will make you swoon for more! 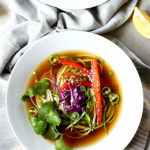 So if you like healing foods on the sweeter side, this is just your cup of tea cup of soup to soothe a sweet tooth craving! 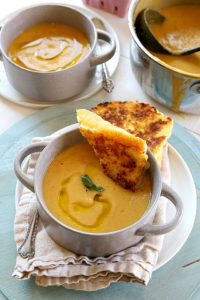 If you prefer a creamy texture, puree the stew after it is cooked and cooled slightly to turn it into a smooth sweet potato soup. For the past month we have been eating soups and stews almost daily. Let’s just say because we are a household of superheros! Starting on October 25, fighting and defeating colds (nonetheless). Not quite how I had the past month planned out. Then the approach of Halloween we literally were a family of superheros! Big C was Ironman, Little C was Batman and my husband and I were supposed to be Superwoman and Captain American. Only I got the cold so there was no energy left in my body to dress up. That cold lasted longer than it should have (over 2 weeks!) but thank goodness for soup to refuel the body with nutrients it needs for healing! 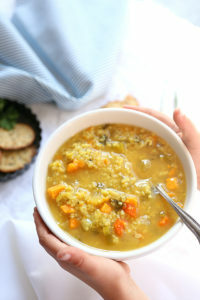 And soup is a great way to ensure a healthy diet for all of us after all that Halloween candy! My husband (being the super hero he is) kept coming home after working bringing us store-bought soups for dinner so I didn’t have to worry about making dinner when I was sick. Once I healed up a bit I made a few batches of homemade soups to have on-hand. 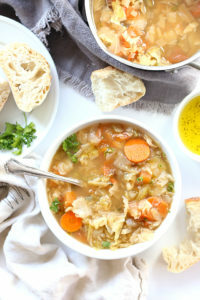 The reality is homemade soup and stew is just as easy to make especially when there are few ingredients. What you will need are sweet potatoes! Peel and chop (into small 1-inch chunks) about 8 cups worth or about 8 medium (5″ long) sweet potatoes. Costco has a large container of organic and already peeled and chopped sweet potatoes so I like to use that for convenience. Next, grab the add-on vegetables. I like to call all the other vegetables add-on because you can literally “add-on” any vegetables that are in your home. Always start with the basics such as onion, carrots and celery. 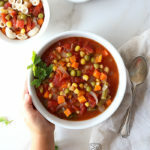 I like to buy these vegetables in bulk and chop a large batch to keep in the refrigerator for meals throughout the week or to make a few different kinds of one pot soups. For this sweet potato stew I had a bit of kale and watercress leaves to use up so I added that but you can also use spinach leaves. Now my favorite ingredient- wine! 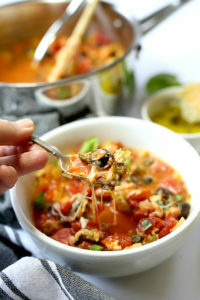 I love wine and I really love wine in soups and marinara sauces because it gives a rich acidity that sometimes is the missing ingredient instead of salt. For this soup use about 3/4 cup of good dry white wine. Don’t worry, the alcohol will cook out of it and what will be left is a robust flavor to the stew. I also add a bit of rice vinegar in place of salt. The vegetable stock has enough salt so there is no need to add any extra. The final ingredients to this fabulous stew are the tomato paste, vegetable stock, garlic and spices that pull all the flavors together. Sweet potatoes are rich in sources of beta-carotene and an excellent source of vitamin A, vitamin C, B vitamins, fiber and potassium. Just one sweet potato can give school age children a good amount of their daily intake of vitamin A! 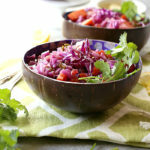 They are also high in antioxidants and minerals including zinc, copper, phosphorus, manganese and biotin. Studies have shown that when sweet potatoes and other color-related phytonutrients pass through the digestive track they may be able to lower the potential health risk of heavy metals. What does that mean to you? If you have trouble with digestive issues or high amounts of metal in the body, sweet potatoes are an excellent food to consume! And since the skins are removed for sweet potato stew, it is an easy to digest meal. 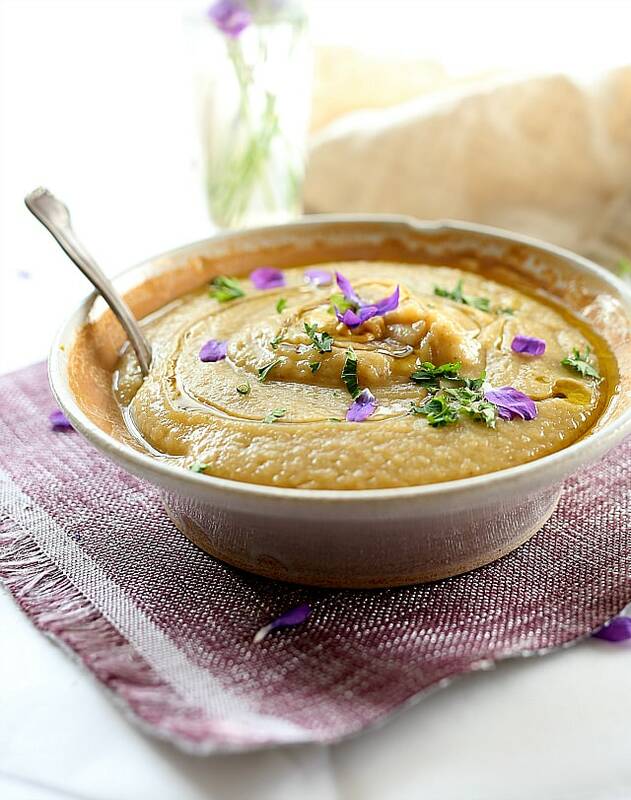 Sweet potato stew so rich and comforting to energize your body on those cooler winter days. Add all the ingredients to a large pot. Cover and heat on high to boil. Once the stew comes to a boil turn down the heat to medium-low, cover and simmer for about 30 minutes. Garnish with fresh celery leaves, oregano and fresh ground pepper. That stew looks AMAZING and so kid friendly I love it. My daughter is very picky but this I think she will be happy to try.